The first thing you’ll want to do is turn the water off that connects to all the parts of the sink and remove any decorative handles or knobs. Then, you’ll want to loosen the screw that attaches to the handle to the stem of the knob. Next, use a flat-head screwdriver to loosen the screw that connects the handle to the stem of the knob. After the screw has been removed, use some WD-40 to remove the handle. Once is has been complete, it’s time to remove the packing nut by using a wrench. The final step of this part of the process is removing the stem. It depends what kind of faucet you have – some will easily come off and other may need to be twisted. Now it’s time to look at the O-ring and washer that is located inside the valve seat. The reason why you’ll want to look at this is because it’s often the cause of water leaks. Remove the washer and replace it. It’s important that the replacement washer and O-ring fit precisely. Next, you’ll want to check the sides to see if they fit either a cone-shaped washer or a flat shaped one instead. You can always take a picture to bring along to the store to make sure you get the correct one, or better yet, bring the O-ring to the store to compare and verify you get the correct new one. Since you have removed everything and disassembled the parts to the sink, it’s time to re-assemble them. 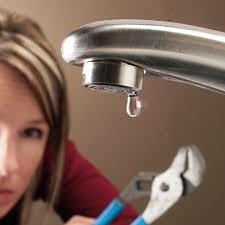 Once you have assembled everything, test out the faucet to see if you have fixed the leak. When doing this, turn on the faucet slowly. If you get to the point of testing the faucet and it’s still leaking, then there may be corrosion your valve seat. If the valve seat is not cleaned on a regular basis, it can cause leaks near the spout. It may also be due to worn out seals or loose parts. When dealing with any maintenance or repairs, it’s always safest and best to call a professional. Not only can a professional do the maintenance or repair work, but also provide peace of mind knowing it’s done the right way! Call Central Carolina Air Conditioning, Plumbing and Electrical to check or fix your faucet for leaks, and we’ll also to check on your water heater, drain pipes, exposed hot and cold water lines and ventilation systems! If the kitchen faucet is leaking, it could be costing you extra money and could be also be providing a lower water pressure if there’s a leak.